I have to admit that I’ve looked at Flipboard before. And I just didn’t “get it”. But I had no idea of the benefits to site owners and bloggers until I did this research. Did you know you can feed your blog content into a Flipboard magazine to generate more traffic and visibility? I didn’t. Or that people like Janette Speyer are offering Flipboard marketing services to many different types of clients? Join us Wednesday, March 20, 2019 from 11:00 a.m. to 01:30 p.m. to get all your questions answered about how to use Flipboard to market your business and drive more traffic to your websites. Janette Speyer is our guest expert on Flipboard and a multilingual Marketing Strategist & Creative Content Creator for organic food companies. Hot Ice Media, the agency where she is a partner, is the first agency to offer Flipboard marketing services. Their full-service department is dedicated to promoting and marketing brands on Flipboard. Now you probably have an idea why some people love to use it. They can read all their favorite news sites and blogs, easily selecting only what they want to see at the time. But how can that benefit you? At this point, you still don’t know the power of what it can do for your brand. Yes, you can curate content to illustrate your thought leadership, build a community, and distribute whatever content you wish. But it goes far beyond that. Some use it as a different type of Pinterest board where you “flip” things instead of “pin” them. But it is easier to organize them and create playlists of anything they way you might create a video playlist on YouTube. Bloggers will love this. 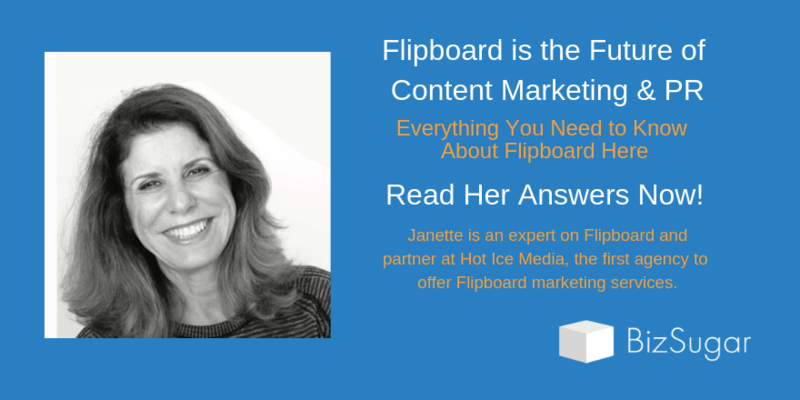 Janette said, “One of Flipboard’s hidden gems is that you can become a Flipboard publisher by submitting your RSS feed and it will populate content from your blog automatically.” Why didn’t we know that? You can see an example here: Web Success Team blog Flipboard Magazine. Janette has already shared a video on how to do it and this link: How and Why You Should Add Your RSS Feed to Flipboard in the AMA comments. Flipboard Can Benefit Any Business – Including YOURS! In an interview on CMSWire for “Flipboard Is Seeing Strong User Growth: Here’s Why”, Janette described a few of the ways she uses Flipboard to benefit clients. Online Branding; Integrated Marketing; Gamification Marketing; Tribal Marketing; Search Engine Optimization; Search Engine Marketing; Social Media Marketing; Online Marketing; Creative Strategies; Graphic Design; Twitter, LinkedIn and Facebook Marketing; Content Creation; Online Promotions; Social Advertising. Want to know how to leverage @Flipboard for #publishing and #marketing? Or to promote your business? Or to find clients? Join us and ask Janette to share her experience. Yes, you are right. Flipboard is an awesome place for marketers to promote contents and increase traffic. Thanks for sharing this information. I find curating contents using flipboard really difficult. I’ve been trying so many times but I don’t know how to properly use it but still, thank you for listing how beneficial it is. I’m more motivated to learn everything about it. I have to admit that I never saw the marketing opportunity Flipboard offers. Been using the app since years. Hi Gail. I just heard. about the Flipboard but i don’t have any idea about it. But now I am clear about the Flipboard and use in regards to content marketing. Thank you for the valuable information. Recently we have a discussion about content marketing with my friend. The conclusion of our discussion end nowhere, But now I have some futuristic idea and will discuss again with her. Keep going Gail, good work. You and me, both! I’ve had a Flipboard account a long time and talk to Janette regularly. But I never knew what is possible. If you haven’t already, you should join our Mastermind Community and read all of the strategies she shared. Flipboard is good but not as well as Twitter or Facebook. I am a Twitter person, myself (for work) and in Facebook groups for interests. But for marketing, we really need to get serious about Flipboard. Did you go to the Mastermind Community and read all the examples Janette shared on how they promote businesses with it? Thanks Gail for featuring Janette, I love using Flipboard and have been using it for years. I flip through it when I’m waiting at places and always find interesting and informative content. I did not realize I could use an RSS feed with it! Great to know. I’ve submitted my questions and will be back later to check in after appointments today. Thanks again! Looking forward to learning more about it . Thank you so much for participating, Lisa. Janette shared some excellent strategies. I have got to find the time somehow to get serious about Flipboard. I think Flipboard is going to be very useful for Content Marketing. This article is a gift for Content Marketing lovers.